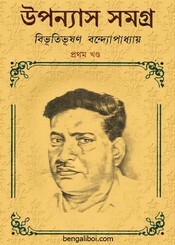 Bibhutibhushan Bandyopadhyay is one of the greatest fiction writer of Bangla literature. A romantic and nature lover writer like him is very rare in Bengali literature. In the description of nature, he was quite unique. This extraordinary ability to describe nature is observed in his novel 'Aranyak'. The author had extraordinary skill in writing all kind of novels but basically his social novels have more popularity. The novel 'Pather Panchali' is an immortal creation of his. Now I want to share a collection book of his novels. There are nine great novels in this first part, these are- Pather Panchali, Aparajita, Aranyak, Adarsha Hindu Hotel, Drishti Pradip, Debjan, Bipiner sansar, Anubartan, Dui Bari. The ebook pdf has 1620 Quality pages with 52mb file size.